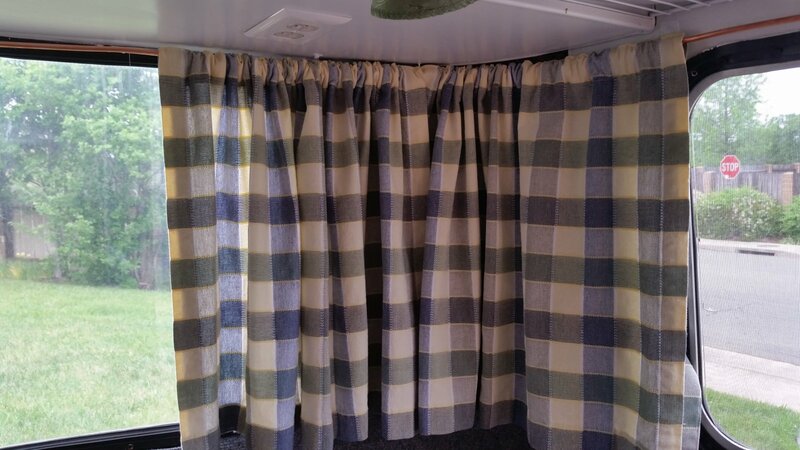 Some of us "glamping" ladies have discussed the problem of curtains and curtain rods. Specifically, when curtains are "open" they still block a lot of the window. It would be nice if the rods were longer, so we could sweep the curtains into the corner. Or even, AROUND the corners. The existing saggy rods in my Lil Bigfoot were driving me crazy. I wanted something that was straight and secure in the center and which also gave me room to push the curtains around into the corners. It had to be strong, yet malleable. 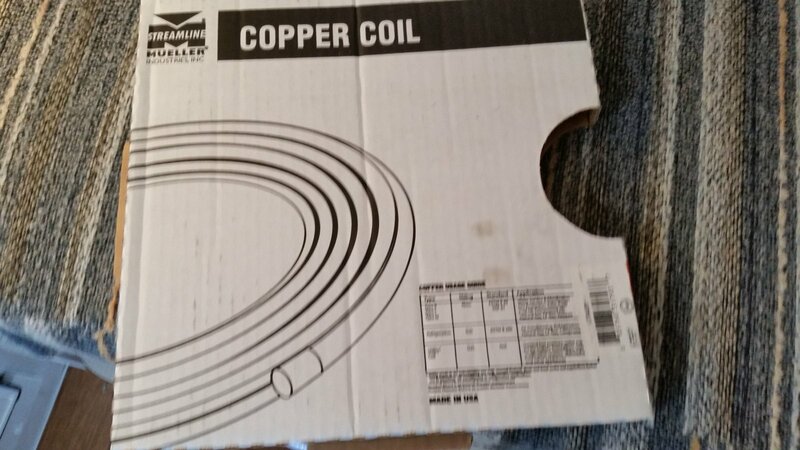 I gambled on copper tubing. This box of 20 feet or so was under $20 at Orchard Supply Hardware. It was just enough to wrap all the way around the rear and sides of the Lil Bigfoot, with enough left over to do the front window. I used basic white cup hooks to support the rod. 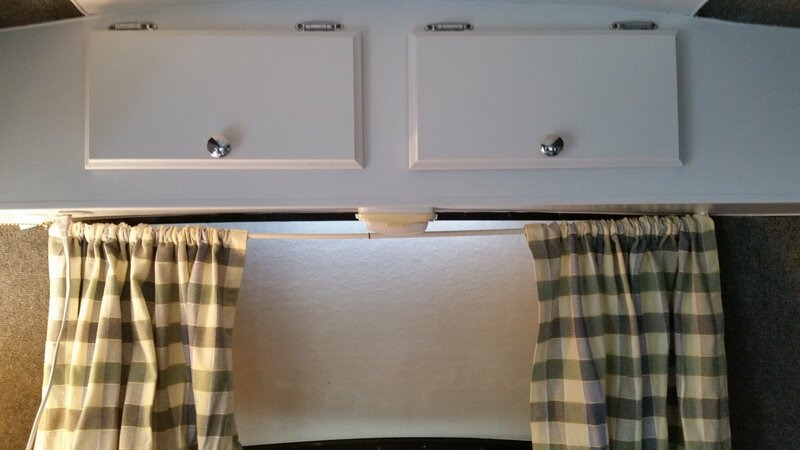 I placed one hook in the center of the back window, one in each corner, and one at each end of the side windows. The rod stretches all the way around the back half of the trailer. I used needle-nosed pliers and simply crimped and rolled each end into a loop, which then hooked over the cup hook. Easy. Once I had this set up the way I liked it, I then felt the need for MORE FABRIC. 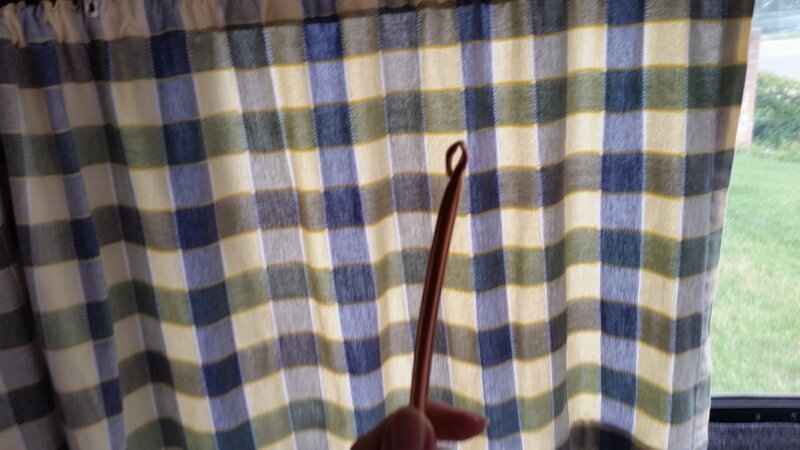 After all, when the curtains are closed, we then have this blank space in the corners, decorated with a bare copper pipe. 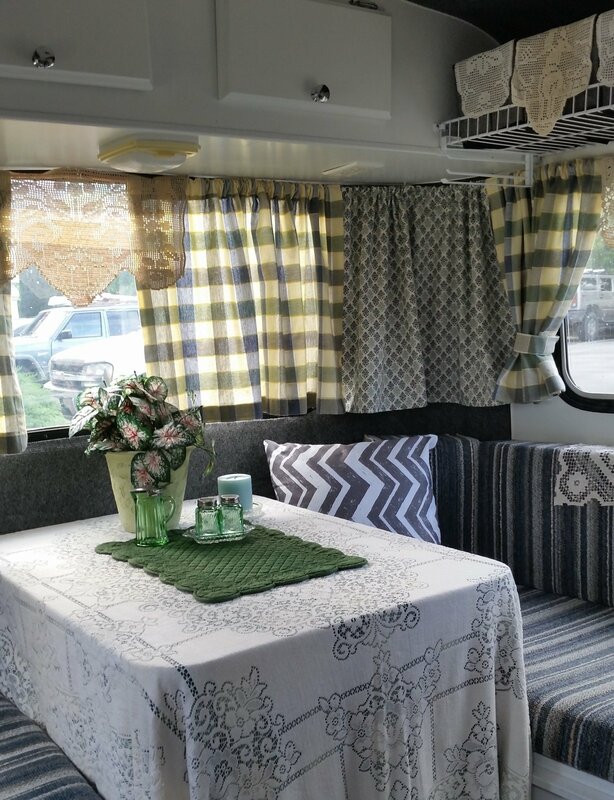 So I went searching for fabric that would coordinate with the existing curtains, which could keep the corners permanently filled in. Now the corners are always covered (no copper rod visible), and my only concern is the copper rod in the center when the windows are open. Yes, it probably only bothers ME. But in the photo above, I hung vintage doilies over the rod during the day. Am still mulling how to create sensible valances that will remain in place. And, at some time in the future I think I'll revisit, because I don't like the curtains hanging "open" at the bottom. I think I would like them secured and gathered. So may experiment with installing another rod at the bottom. But for now, I'm happy! Nice mod Ellpea, soft copper, who would a thunk ? You could paint the tubing to blend in with the wall color. With a bit of planning, you could run propane to wall sconces. Ikea sells curved corner curtain rods if someone does not wish to fabricate the corners. the corners are always covered (no copper rod visible), and my only concern is the copper rod in the center when the windows are open. Yes, it probably only bothers ME. But in the photo above, I hung vintage doilies over the rod during the day. Am still mulling how to create sensible valances that will remain in place. One thing you could do would be to get some white Duck Tape and take the rods down and ensuring the tape seam ends up towards the wall run the length of the tube, this way whatever is exposed is white and blends with the trailer. Otherwise, what you've already done looks awesome! brilliantly clever idea and execution! If I hadn't already made the roll-down panels, secured by industrial magnets at the lower corners, I'd have seriously considered the corner copper rodding! Must say, the rod, when curtains are open, doesn't bother me at all; it's a curtain rod, no shame there! But valances would be good, too, and I love the doilies. I wanted corner curtains in my Compact Jr for a different reason, to hide Reflectix on the walls. Under the windows I covered it up with oak veneer plywood. But I needed curved rods for the corner material. Mine was quicker, dirtier and cheaper, not much "glam" in my camper. But it worked ok. I used dowels that insert into eye hooks on top of the window trim. To conform to the corner two pieces of dowel were inserted into a short piece of plastic tubing. Don't examine the curtains too closely, they aren't hemmed yet! Say, John Madill, that's clever, too! I like it a lot! Photos look good...I like the Compact Jr. and its layout; the curtains really do the job! Thanks! It's nice to see I'm not the only one who likes to mix it up with fabrics! Kathleen, have you posted photos of your roll-down panels? How did you do them? This used to be my hubby's response to my ideas (who woulda thunk), but now he just gives me my head! Painting the rod is a good idea. I wondered if I would have trouble getting the paint to "stick?" Wipe it down with acetone ect to remove any oils first, it'll stick fine.